The not so far Ajanta Caves and Ellora Caves have overshadowed the values of another complex of beautiful cave temples – Aurangabad Caves. 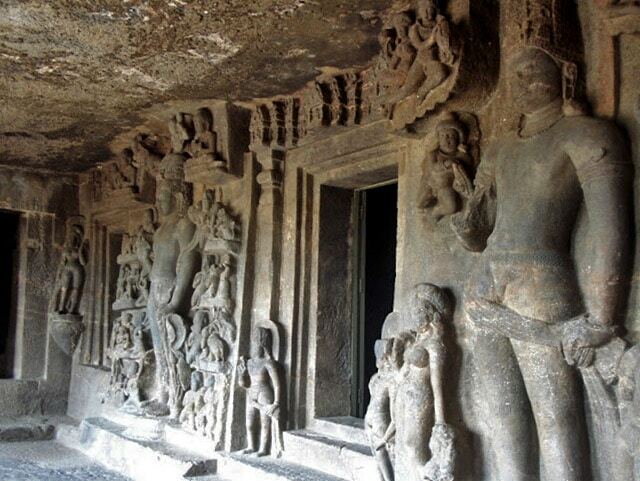 Aurangabad Caves contain some of the most beautiful sculptures known to be created by Indian artists of classical period. 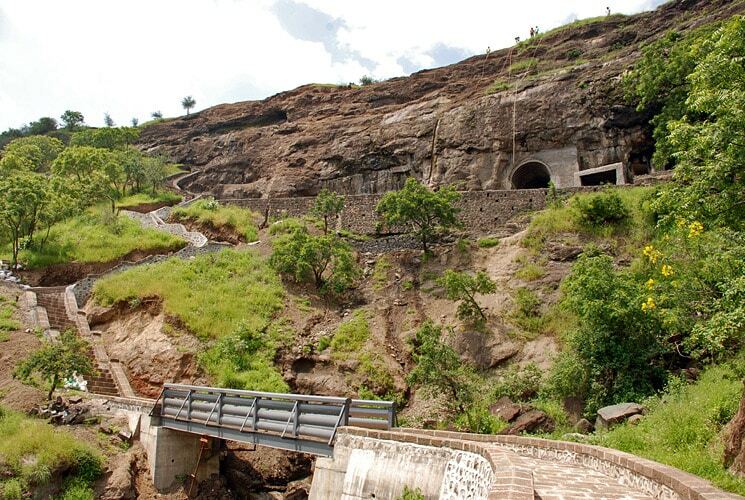 Caves are located few kilometres north from Aurangabad city, in steep slopes of a hill running roughly from east to west, some 20 m above the surrounding plain. They were unknown to Europeans until middle of the 19th century. Aurangabad is located close to ancient trade route and rather close to Paithan – the ancient capital of Satavahanas, contemporary Pratishthana. Buddhism in India was spread by traders and Buddhist cave temples often were established along such trade routes. 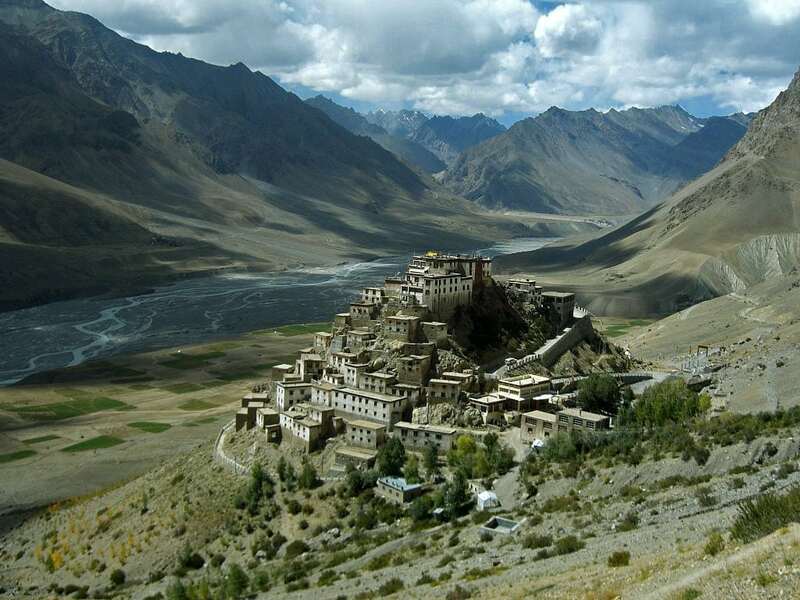 These temples and monasteries served also as safe inns for weary travellers. In total here are 12 Buddhist caves divided in three groups. The westernmost caves comprise the first group and are numbered from 1 to 5. Second group is located some 500 m further to the east and includes caves 6 to 9. The easternmost group is located 1 km further to the east and includes caves 10 – 12. Caves are cut in a basalt of rather bad quality, with fractured zones where the rock is not suitable for carving. This has prevented creation of large caves – builders of caves had to avoid the parts of bad quality rock. Some excavations were stopped as fractures were reached. Caves are carved in cliff in time period from the 2nd – 3rd century AD to the 7th century AD. The oldest are caves 1 and 3, possibly excavated in the 2nd – 3rd century AD. Cave 1 is unfinished monastery – vihara. Ceiling of verandah has collapsed. Only portico and pillars are finished. Verandah contains three panels depicting Buddha with Padmapani and Vajrapani. Cave 2 is chaitya – square shrine with a circumabulatory around it. It contains a square shrine. Collosal statue of Buddha is located in the shrine. Entrance in this shrine is adorned with depictions of Avalokitesvara on either side. Cave 2 contains several sculpted images of Buddha. Cave 3 is large monastery – vihara. It contains pillared verandah with cells on either end. After verandah comes main hall with square pillars, with two cells in both sides, with pillared porch and a shrine. Pillars in hall are arranged so that they form a square, these columns are richly decorated with floral and geometric motives. Architrave above the pillars is adorned as well. Cave 4 is chaitya griha of Hinayana order. Unfortunately it is in bad shape due to soft rock – front part of this cave has collapsed – there still are visible stumps of pillars of this part. 12 beautiful octagonal columns in rectangular hall have been preserved, they are adorned with with carvings depicting scenes from Jataka tales – tales about the previous births (jāti) of Buddha. These columns divide the hall in main part and side aisles. At the rear part of hall there stands stupa – it is a high cylindrical drum with bulbous dome and with sculpting similar to inverted pyramid rising above it. Such style of stupa testifies that this chaitya griha is made the latest in the 3rd century AD. Ceiling of hall is reinforced with stone ribs resembling wooden architecture. 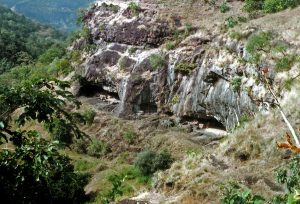 Other caves in other groups are attributed to Kalachuri dynasty. The second cave group contains mostly unfinished caves due to bad quality of rock. Cave 6 contains well preserved sculpted depictions of women with exotic hairstyles and ornamentation, as well as huge figure of Buddha and depiction of Ganesh in shrine. This cave consists of shrine, pillared porch and verandah with cells in both sides. Cave 7 is the most elaborate, with beautiful sculptures. This is chaitya griha – large shrine with central hall with circumabulation and with an outer corridor around this hall separated from the hall by a row of pillars. At regular intervals in corridor are located recesses with reliefs depicting Buddhist gods and goddesses. In verandah, at the entrance in hall there are beautiful reliefs. In one side there is depicted Avalokitesvara, in another – Bodhisatva. Depiction of Avalokitesvara is especially elaborate – it represents the Bodhisatva Padmapani as "Saviour of Eight Great Perils" – Fire, Theft, Demon, Elephant, Lions, Shipwreck, Snake, Monkey. Another panel inside the darkness of the shrine, to the left from the central shrine door depicts Tara – principal consort of Avalokitesvara. To the right there is relief depicting a group of six scantily clad female musicians – this panel is much photographed and may be the best known artwork of Aurangabad Caves. The main figure in the centre of composition is in dancing attitude, remainig five are sitting and playing different musical instruments. It is considered that this sculptural group hints to development of tantric Buddhism. Cave 9 contains a group of three shrine complexes which can be approached from oblong verandah. Cave is adorned with impressive panel showing Buddha in mahaparinirvana – the final nirvana. Other caves of second group are less interesting, for most part representing incomplete excavations. Aurangabad Caves, Archaeological Survey of India. Web page not active now, was accessed on April 24, 2010. Wondermondo considers that India is the second richest centre of architectural heritage in the world after Europe and may be no single country of the world can match it in this respect. Buddhism is one of the world religions and at the same time is a spiritual philosophy with diverse traditions, beliefs and practices. 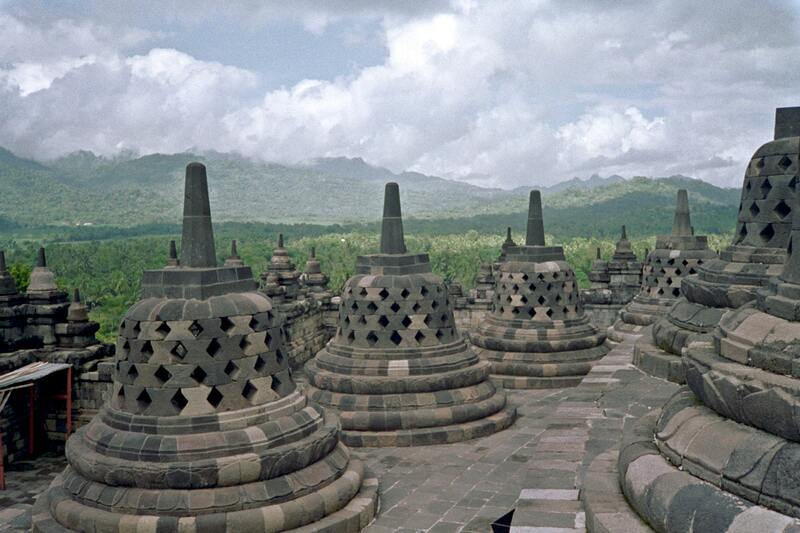 There exists rich tradition of architecture expressed in Buddhist temples and monasteries. 288 pages, 115 illus. in color and 334 in monochrome half-tone and 58 line drawings. The beautiful State of Maharashtra is blessed with thousands of temples which include those dedicated to Jyotir Lingams, Shakti Peetams and Ashta Vinayak. With Temples of Maharashtra – A Travel Guide, we embark on a spiritually fulfilling journey to some of the most sacred places of worship that dot the map of the State with tremendous diversity, traversing along rugged mountain ranges and banks of holy rivers to rural interiors and the urban expanse of metropolitan cities.